NGOs India is a national level Social Network of Non Governmental Organisations (NGO), Non Profit Organisations (NPO), Voluntary Organisations and Social Organisations. The members of NGOs India are from all over India. Presently NGOsIndia.com is also providing an online web directory and NGO resources of Indian NGOs. All the NGOs enlisted in the web portal are not recognised and are not members of our network. We are updating the information about the NGOs and we are verifying the recognised NGOs and providing their information on certain terms. The NGO portal is containing information about grassroot level Non-Governmental Organizations (NGOs), Non Profit Organizations (NPOs), POs, GOs in India, Funding Agencies, Social activists and concerned stakeholders, Volunteers, Volunteer service organisers, Social issues, NGO Funding Projects, job opportunities in social sector, success stories of individuals as well as organizations, and other relevant information and resources. NGOs India has been disseminating the online identity by the Web pages of the NGOs to strengthen them and share their experience with other NGOs, groups and persons of society. This identification can help the NGOs as funding agencies, supporters, volunteers to find them out to support the enlisted NGOs. Presence and contact detail of NGOs are useful for the persons who are seeking for support and help from the NGO in their and other related areas for various purposes. NGOs India is committed to social justice, sustainable development and human rights. The right to communicate freely is a basic human right and a necessity for sustainable development. Access to information is essential to informed decision-making at all levels. NGOs India is committed to the dissemination of information and promotion of sustainable development initiatives, in response to the needs of under represented and marginalized sectors of society. For bridging the data gap and improving information availability NGO network is committed to develop and establish an ideal medium for the Participation and exchange of a trusted and accurate source of quality information. NGOs India is an online resource center for required resource materials, information and all kinds of knowledge-based documents for NGOs. 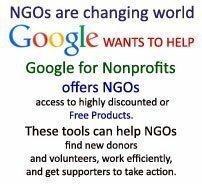 NGOs India provides the resource material where NGOs can find various options and opportunities to get useful and authentic information. Along with the resource material, NGOs India provides direct support and help for NGO Registration, NGO Management, to find and get Funding and financial Projects. NGOs India guides and supports to get funds for all kinds of Social development issues. On the online resource center, NGOs and their associates can find database and information about the funding schemes of Government ministries, Government departments, public sector units, Indian Funding agencies, foreign Funding agencies and support groups. NGOs India has been promoting and making resource and information collaborations for two decades with the creative and constructive networking among NGOs to develop the effective partnership so they can work to implement their objects to develop and improve the socio-economic status of the society. The Networking is for accessing, sharing and contributing resources, issues, information and to associate with other like-minded NGOs which are working on similar issues or other issues to improve the social development and living with healthy conditions. The Networking is for strengthening of NGOs and social organisations from improving their knowledge, identification about their tasks and programmes by getting and sharing the experience with the NGO partners in their certain relevant sectors. 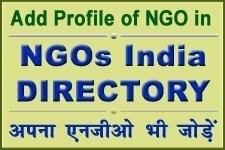 NGOs India is dedicated, for a long time from capacity building of grassroot organisations and their activists to get funds and support so they can implement their projects and programmes, the available resources at this single platform can help Charity organisations and groups of people to serve the society in a better way. Many NGOs exist which do not have funds or do not want funds or want to work with more than their available resources, this is possible through Volunteers and support persons. NGOs India has been providing a network of Volunteers and the recognised NGOs who wish to work with Volunteers for social cause. NGOs India has been supporting the recognised NGOs who are transparently working for social changes in the society and the Volunteers associated and working with such good NGOs feel satisfaction to contribute their time and resources in various sectors of the society. Non Governmental Organisation (NGO) is a non profit social service voluntary organisation of community, persons, volunteers, civilians and citizens. NGO is registered at Government registering authorities but it is managed, operated and worked by its members and associated persons under and as per the rules, regulations and laws of the Government of that country but independently from government control. NGO is not a part and directly controlled and monitored by Government but works according to the policies of the Government more specifically for development and welfare of society, areas and communities as Governments use to work. NGO works to improve the policies, enhances the work pattern, improves and implements the welfare and development schemes of Government and causes for human welfare. NGO can not be a part of Political party but works as organised civil society, as an organisation to advocate, promote and monitor the political working based on development of society with the human right issues, education, health, environment and other welfare and development causes, aims, objects and issues. NGO operates, organises, manages, supports and runs programmes, activities, projects and works at local, regional, national and international level according to the requirements and operational capacity of the NGO. Orientation based NGO runs, manages, supports, undertakes and implements Natural Resource Management, Empowerment, Social Development, Social Awareness, Political Awareness, Animal Welfare, Economic and Financial Development, Infrastructure Development, Improves and undertakes Livelihood programmes of communities, improves and maintains culture, improves and implements technological and science related tasks and programmes to improves the living of human beings. NGO Works and supports to govern and implement laws, works to create laws and policies for welfare and improvement of human life in mutual concern. What is NGO Know what is meaning of NGO and Type of NGOs. Many people including those of the new generation who wish to work to make social changes and for social welfare want to form and register NGOs so they can work in their relevant fields. NGOs India provides useful and authentic information, knowledge base and all kind of resources, options and opportunities for NGO Registration, NGO Support to get Funding and Projects and NGO management. 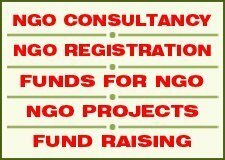 NGOs India provides information regarding the recognised NGO Consultancy and NGO Consultants for NGO Registration service, NGO Funding Services and NGO Consultancy services. If anyone needs NGO consultancy services for NGO Registration, funding, fund raising, project writing, project proposals, project formation, annual reports, NGO management, NGO operation and concept writing, you can contact to our recognised NGO Consultants and Consultancy Services. If any NGO needs to get help and information regarding NGO documentation, FCRA Registration process information and other kind of information for NGO formation to work among communities, just contact recognised NGO Consultants for your requirements to get help and support. You must be clear that just after registration/formation of NGO or only registered NGO with no social work programmes and profile are not eligible to get funding from Government and Funding agencies. If any recognised NGO need support for fundraising campaigns then recognised consultants team can help you with that and also on how you can start and operate fund raising campaigns. If a team of social activists who are part of an active NGO want to get funds for running their project and process they can get funds, in this regard please contact our recognised NGO Consultancy team. We provide support and help to raise funds to the deserving and well recognised NGOs. The new NGOs and working NGOs which need financial support from the Government and private funding agencies so they can implement their concepts. NGOs India team and resource centre have been helping and supporting such persons who wish to form NGOs and want economical and other support with he help of projects and other support. At the online resource centre information regarding Funding agencies, Funding Schemes, Funding projects and Funding and other resourceful material regarding running, managing and implementation of concepts of social change by achieving funding and support of Volunteers is available and being updated from time to time. Non Government Organisation (NGO) is citizen based non profit group works for social welfare and sustainable development. The main aim and objective of any NGO is same as the aim of Government for development of society. Governments have control on resources but the organisations formed and working for the welfare and development do not have resources so they have to arrange and manage resources. NGOs function for without any profit but can work with funds and financial resources in present system. So funding is the basic and main part to run and organise the programmes they use to work or want to work. So if any NGO wants to work with capacity it needs to get grants from various sources. NGOs get grant from various sources, individual donors, foundations, corporations, and governments. Funding sources for NGO include membership fees, private donations, public donations, grants from local, national and foreign funding agencies, philanthropic foundations, Government funding schemes, sale of products and services and CSR funds from private corporate sector companies. NGO requires funds for operations, salaries and other overhead costs. Fundraising efforts are necessary for existence, operation of programmes and success in the aims of NGO. Funds can be received under the various Funding Schemes. NGOs India recommends its associates, recognised NGO Consultancy service providers for NGO Registration, NGO Funding and other required support.